Room "Comfort" - [En]Terrou-Bi - Hôtel 5 étoiles - Dakar- restaurants- plage privée- piscine- casino [en]Terrou-Bi - Hotel 5 star - Dakar- Best restaurants- private beach - swimming pool – marina - casino. Discover Terrou-Bi Hotel’s sublime comfort and quality service at an attractive price with a Room "Comfort". With 32m² of warmth and zen, you will immediately be swept into a state of wellbeing. 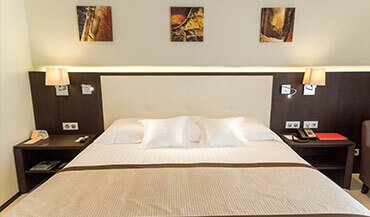 Enjoy a restful night in our comfortable beds. 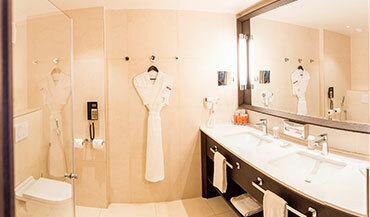 Refresh in spacious bathrooms in the bathtub or the walk-in shower, double sinks and refined amenities. Stay connected with complimentary internet access or just enjoy one of the many satellite TV channels.